The 2016 NFL season’s first four weeks are in the books, which means it’s time to look at Week 5’s picks against the spread. 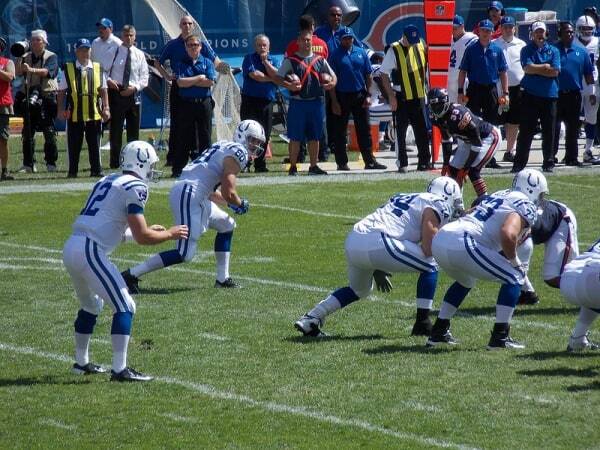 Early Sunday afternoon, we have a cross-conference matchup between the Chicago Bears and Indianapolis Colts. Who has the best odds in this one? Location: Lucas Oil Stadium; Indianapolis, Ind. Sports Information Traders went 14-6 in the first four weeks of the season in the Westgate Las Vegas Supercontest; learn more here! At one point, this probably looked like an easy game to call. The Colts had higher expectations than the Bears — what with Andrew Luck returning completely healthy and such — but that may no longer be the case. Both the Bears and Colts are 1-3 at this point, with the Bears beating the Detroit Lions and Colts losing to the Jacksonville Jaguars this past Sunday. What makes this matchup even more intriguing is that the Colts are about to be the first team in NFL history to not have a bye week following a game over in London. Unfortunately, that’s not a positive record for them to hold. That jet lag is undoubtedly going to play a factor, especially after traveling all that way just to lose to a divisional opponent. It’s 13 miles short of 4,000 from London to Indianapolis, and a five-hour time difference; and in the short history that the NFL has played regular season games across the Atlantic, every team has been able to take off the next weekend and rest. The Colts don’t have that luxury, and surprisingly didn’t want it. While the logic of wanting the bye week more in the middle of the season than in Week 5 makes sense, it may bite them in the rear this week as they’re in danger of falling to 1-4 which would make winning the division an extremely unlikely achievement. Chicago, meanwhile, should be starting to feel a little better about itself. The team finally broke into the win column, and did so in impressive fashion against the Lions. Detroit’s offense had been solid up to this point in the season, putting up 27-plus points in two out of three games; and veteran quarterback Matthew Stafford was playing very well in his first season without Calvin Johnson, tossing seven touchdowns to just two interceptions through those three games. But the Bears’ defense had what could be viewed a turning-point performance. They allowed only 263 total yards, no touchdowns and forced two turnovers in the game. In fact, it was 17-6 with around two minutes left in the game before the Lions returned a punt 85 yards for a touchdown, making the score much closer. The offense also had an impressive game, as Brian Hoyer and rookie Jordan Howard kept the ball moving all game long. The offensive line, which has three new starters — two of which were implanted in their current positions after the preseason and only a week before Week 1 — is starting to come together and has put up solid back-to-back performances. Despite a rocky 0-3 start in which there were very few bright spots, the Bears are going to be more formidable than most analysts believe. Not to mention, Chicago started 0-3 a year ago as well, but then won four of the next six. Will that trend repeat itself in 2016? Bets to Make: the Bears may not win this game on the road against the Colts, but it’s going to be close. If the line doesn’t move from its current 4.5-point margin, that’s a great underdog bet. Take the points, as the Colts have struggled this year mightily on both sides of the ball, and the odds of them winning by more than four just aren’t very likely. As well, take the under. The Bears last year were able to keep games close and low-scoring, as the successful recipe has been control the clock.